I first met Rennie Curran over a game of cards in early 2008. No the game was not Texas Hold ‘Em or Black Jack. The game was Apples to Apples. Seriously. A buddy and I went over to another buddy’s house for a game night and Rennie, then a freshman coming off a spectacular first season, just happened to be there. He had on one of those athletic pullover jackets that looks puffy on everyone. It looked puffy on Rennie like it would on anyone else so I gave him a bro-hug while celebrating his athletic achievement with some comment along the lines of “Whooooaaaa…Rennnnnieeee.!! !” When I went to slap his shoulder I was not greeted with puff. I was greeted with the harsh reality that is Rennie Curran’s physique. He was (and is) a beast. Rennie was kind enough to answer a few questions and share a little more about his soon-to-be-released book, Free Agent, (out April 6th, available for pre-order here). Will the new book turn the “Liberian Dream” into the “Librarian’s Dream”? DudeYouCrazy: Rennie, get Dawg fans up to speed with what you’ve been up to over the past couple years. Rennie Curran: I don’t even know where to start. Since I left the University of Georgia I have been to too many places, and I have had the opportunity to meets lots of both good and bad people. There have been lots of ups and downs, but all of the experiences have made me a stronger and wiser man. I was originally drafted by Tennessee and played there for the year (Rennie’s rookie season was 2010). The coaching staff that brought me in was fired after my rookie season, the lockout began, and I was released after they decided to bring in a new coaching staff. I was later picked up by the Buccaneers, but ended up being in the same situation with new coaching staff. I have spent the past couple years traveling, developing relationships, and gaining experience that will help me whether I play another down of football or not. Most of all, I have spent the last couple years trying to be a great father to my beautiful daughter, Eleana Curran. DudeYouCrazy: It sounds like you’ve had quite the journey. Outside of football, what would you label as your greatest accomplishment since leaving the University of Georgia? Rennie Curran: Outside of football, my greatest experience was taking my entire family back to our home country of Liberia after my rookie season. It was always my dream to be able to do this since I was born in Atlanta at the beginning of the Liberian Civil War. The country really embraced me as their own and I was able to see a a lot of things including where my great grandparents were buried, where my parents met, and even got to meet with some government officials. The trip really changed my life after seeing many people that did not have lots of the things we take for granted. I returned back to Atlanta with a new mission, realizing that I wasn’t just playing for myself, but I had a whole country behind me. DudeYouCrazy: Is that the kind of inspiration that made you want to write a book? How did that mission get started? There aren’t many 24-year old published authors out there. Rennie Curran: Originally I started writing not as a way to inspire people, but as a way to vent. I was in a place where I had no idea what was going to happen next. A crossroad point where I had to ask myself whether to continue to pursue my dreams, or give it up and pursue other things. As I got into the book I realized that this was a place everyone arrives at some point in their lives. I realized that I could use my story of deciding to not give up on my dreams to encourage and inspire people. I realized that there were many young people that were lost and need a word of advice from someone they can relate to. I had a lot of free time since I was a free agent, and wanted to use the time I was given wisely. DudeYouCrazy: That’s a lofty calling, you’re a brave man for taking it on. In one sentence, tell folks out there why they should pick up a copy of your book? Aside from the fact that both you and I are telling them to. Rennie Curran: You should buy my book because you or someone you care about will be inspired by at least one of the topics I discuss. DudeYouCrazy: That certainly sounds fair enough. One last nerd question: Were there any authors that you have looked up to whose influence may be seen in Free Agent? Rennie Curran: Napoleon Hill, Malcolm Gladwell, Jon Gordon, Og Mandino to name a few. DudeYouCrazy: I’m just going to pretend that you meant to mention me. I’m sure it was implied though. For more on Rennie Curran and his book go to www.renniecurran.com. Autographed advanced copies of his book can be purchased here. And, for those of you attending G-Day, he will be featured at a book signing at the Georgia Bookstore on April 6th from 10:00 AM – 1:00 PM. What’s the real value of an education? Are the athletes even truly “amateur” within today’s system? How many athletes are receiving better educations because of their athletic abilities? That sounds a lot like compensation. How many are receiving free or discounted education in exchange for their work on the field/court? That sounds a lot like a job. If the NCAA is so paranoid about lawsuits filed by the likes of Ed O’Bannon and the continued use of “player images,” why not eliminate the grey area altogether? Instead of selling a number 11 Georgia jersey without Aaron Murray’s name and saying “oh that’s not Aaron’s jersey, it just happens to have the number 11 on it,” why isn’t every NCAA replica jersey made to feature jersey number 0. Combine that with a rule forbidding players from wearing number 0 and we might have less controversy. When EA Sports makes video games, why not use completely ridiculous jersey numbers, make all the running backs white and move on. Nobody outside of Nebraska fans would think the white running back was a representation of a real player, especially if he worse jersey number 72. The NCAA shouldn’t act surprised when players want to be compensated after the NCAA intentionally licensed items to almost mirror real college athletes. Everybody talks about athletic revenue profit-sharing as if it actually makes sense. The only hang-up most people see is “some sports aren’t revenue sports.” I find that predicament wildly interesting and almost comical. In reality most sports lose money for the universities involved, but athletes say they aren’t compensated fairly. If I work for a failing business should I be paid – in cash, scholarship dollars or donuts? No. Would swimmers – equally gifted but less profitable athletes – really feel much better if each sport split up its profits at the end of the year? Of course not; they wouldn’t generate enough revenue to cover scholarship expenses. On the flip side would football players really like splitting all athletic revenue with all sports? Of course not; Aaron Murray wouldn’t want his earned money going to a swimmer. College athletics gets knocked for being “big business” and yet most folks who are in favor of paying athletes say things along the lines of “a big business should compensate its employees.” Do you want this to be a business or not? UGA estimates its out-of-state tuition, fees, room, board, books and living expenses to total $39,460 per year. Let’s pretend that an athlete “works” on his or her craft 30 hours every single week (this is extremely generous: the NCAA limits practice to 20 hours/week during season and 8 outside of the season). This gives an athlete – say the aforementioned Aaron Murray – 1560 billable hours of work each week. So with those estimated expenses, Murray earns $25.29 per hour. That’s pretty darn good pay for a college kid. But, you say, “Isn’t Murray’s skill-set rare enough to merit more payment than that?” “Yes!” is the short answer. But you’re just looking at the supply of Aaron Murray’s. Lost in that is the fact that Aaron Murray is a student-athlete. He is a college student. With the massive supply of students in any college town, what do you think the going rate for student employees is? It’s minimum wage. So from that side, isn’t Murray doing pretty good for himself? He’s making $25/hour, avoiding college debt and getting a heck of an education. I’d say he’s being compensated. What if I told you that you could own a piece of SEC History for just $100? Guess what. You can own that piece of history. Go here, and bid this item up. I want it to pass Babe Ruth’s $4.4 million jersey sale. 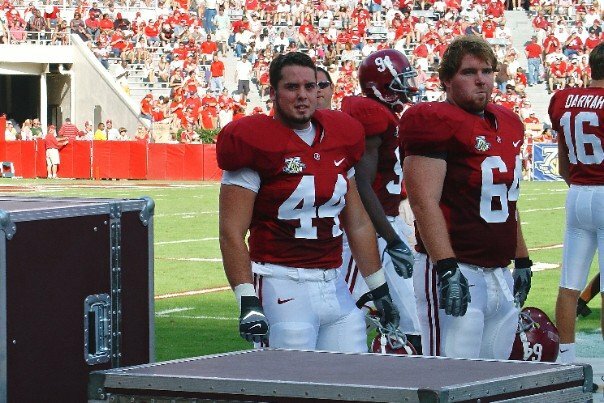 In case I haven’t been clear enough…A game worn Jake Vane Alabama Football Jersey from the 2008 season is being auctioned. Jake Vane might or might not be wearing the very item up for bid in this photo. You’re still not convinced that this is historic memorabilia? What if I told you that I once celebrated Jake’s birthday with him at Celebration Station in Knoxville, Tennessee. That’s right. As elementary schoolboys we partied so hard we needed our own designated station for celebrations. This is the jersey of a party animal. What’s that party animal up to now? Just slaying Hollywood. You might recognize him from his appearances in Comedy Central’s “Workaholics” or his appearances in both Powerade and Gatorade commercials. You think I’m making this up, don’t you? 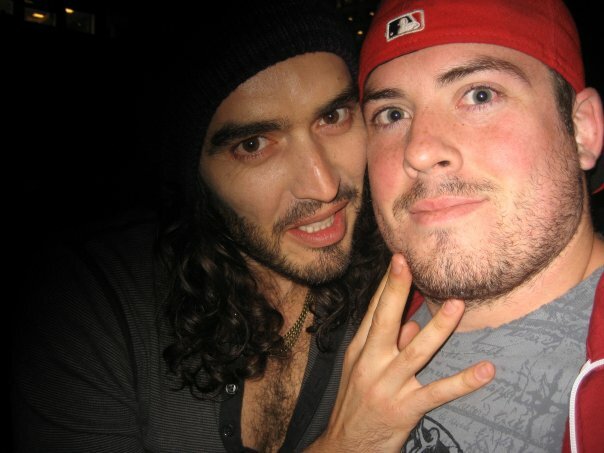 Would a picture of Russell Brand caressing Jake’s face help? When Jake’s the next Don Cheadle, you’re going to wish you had purchased this jersey when it was just $4.4 million. I just bid $100. Beat me out fools. Georgia held its first full scrimmage of the Spring yesterday and either the defense is really good or the offense is really bad (it should be noted that Aaron Murray did not participate as he was at an awards banquet). Who steps up at running back? Obviously, I was thinking about this as “who’s going to back up Gurshall?” and as I detailed in the comment section yesterday, the two freshmen were extraordinarily healthy last year. That’s not the norm. Furthermore, over 15% of the carries are now gone due to graduation or transfer. Georgia needs a third (and maybe a fourth) back to emerge. I don’t know that one did. Keith Marshall carried the ball 11 times for 71 yards while Todd Gurley touched the ball just twice for fifteen yards. That doesn’t tell me much. The fact that newcomer J.J. Green got six carried and Brandon Harton got five tells me that they are likely “the guys.” But those two each averaged just 1.0 yards per carry. Kyle Karempelis added three carries for 21 yards. Georgia still needs a defined third back. Who is the backup? With Murray out, plenty of arms were on display. It got ugly. Passing conditions weren’t great (it was cold, damp and windy) but anytime four QBs combine to go 26 of 54 for 283 yards, 1 TD and 6 INTs, panic tends to set in. That’s a passer rating of 76 and change, and would be Aaron Murray’s third worst game ever (following poor outings against South Carolina in 2012 and LSU in the SEC Championsip in 2011). Hutson Mason seems to be the man based on workload (he had 23 attempts, nobody else had more than 11 and he got the majority of the first-team work), but if he continues to have 14 of 23 for 186 yards, 1 TD and 2 INT days he might leave the door open to be passed. That being said, maybe Georgia’s defense is pretty respectable (I think that is the case) and for a backup against a good first team defense that’s not terrible for a first scrimmage. Interestingly enough Christian LeMay was the only QB to not throw the ball to the wrong team; but that goodwill was negated by his 1 of 11 passing. Parker Welch hit on 50% of his passes but threw a pick, Brice Ramsey hit on 90% of his passes – but three were to the wrong team. In all seriousness: where is Faton Bauta? By all accounts he’s the hardest working guy you’ll ever meet. He was listed as 6-3, 225 coming out of high school and runs a 4.55. He had offers from Bama, Louisville, Miami, West Virginia and others. But he can’t find the field ahead of Christian LeMay’s 9% completion rate and Brice Ramsey’s 3:1 INT:TD ratio? I admittedly am lacking in research on this topic. For all I know he’s hurt and that may be common knowledge, but where is he? Who puts pressure on the QB? Georgia gots some answers here. T.J. Stripling, Ray Drew and Jordan Jenkins all registered 2 sacks. I think those three guys will have big 2013 seasons. Lucas Red and John Atkins each added one. Who makes all the tackles? Ramik Wilson stepped up with 7 stops, newcomer Tray Matthews added four. Four other players (Connor Norman, Ray Drew, Josh Harvey Davidson Roger Clemons, Jordan Jenkins) registered three. Who makes plays? Tray Matthews made some plays and Richt singled out his efforts. Sheldon Dawson picked off two passes – but it sounds like I would have gotten my hands on one if I’d been there. Who steps up at running back? We know Gurshall can run the ball, but who will the third back be? Who gets productive touches today and sees the field a lot – an indicator of developed pass blocking as much as anything? Is there a quarterback battle? We all know Murray will be the starter and hopefully a Heisman candidate, but is Hutson Mason a lock for the backup spot? What’s the status on Christian LeMay? Is he prepared to live up to the hype of his recruitment and push Mason? What about Parker Welch? Is he continuing to demonstrate competency and improvement? Nobody mentions Faton Bauta? Is he going to be lost in the shuffle? And of course, what about newcomer Brice Ramsey? Who puts pressure on the QB and/or gets into the backfield? Jordan Jenkins seems like the obvious choice here. Who is the “load-bearing” tackler? Alec Ogletree, Shawn Williams, Jarvis Jones, Bacarri Rambo, Michael Gilliard, Sanders Commings, Christian Robinson, Kwame Geathers, Branden Smith, Cornelius Washington and Abry Jones combined for 674 total tackles in 2012. All of those guys are gone. Who is going to step up and just tackle folks. We need some Rennie Curran-style guys to just be in the right place at the right time and bring folks down. Amarlo Herrera certainly seems to fit the bill. Who else will join him in putting up big tackle numbers? Who is going to make plays? Damian Swann is the best play-maker the Dawgs have had at the corner position in several years. Last year he registered two sacks, hit the QB five more times, broke up five passes, intercepted four passes (61 return yards), forced two fumbles and recovered two fumbles (49 return yards). Who else can put together those type of numbers? Bacarri Rambo is gone now, and he’s taken his 16 career interceptions, six forced fumbles, two fumble recoveries and 18 pass break-ups with him. Lastly, I would expect some emphasis to be placed on field goal kicking. I want to see if Georgia can make those now. That would be nice.